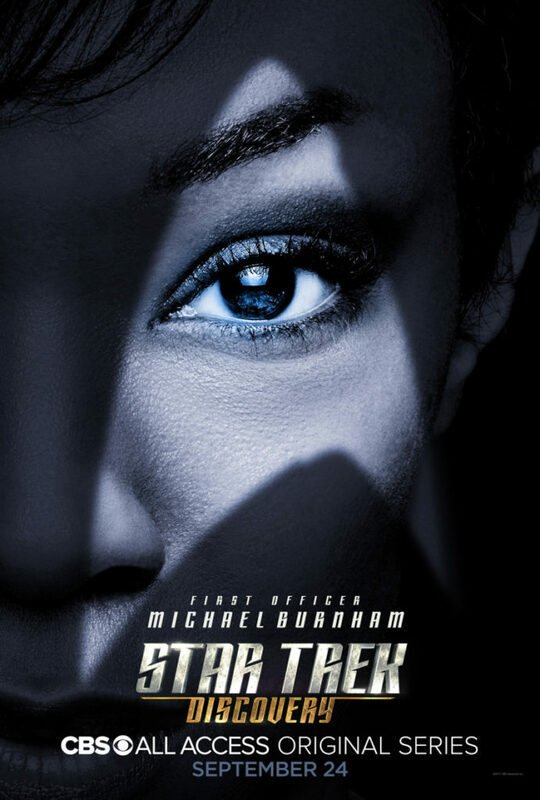 Michael Burnham (Sonequa Martin-Green) is a disgraced First Officer who is almost single-handedly responsible for igniting the war between the Federation and the Klingons. She’s rescued from prison by the shady Captain Lorca (Jason Isaacs) and hired on as Science Specialist on his ship, the USS Discovery. Captain Lorca wants Burnham to help develop a new form of space travel by using a spore drive to “jump” the ship rather than the traditional warp, which Lorca believes will be a vital asset in winning the war. But the technology is new and unpredictable, and the Discovery soon finds itself crossing dimensions and even travelling through time, which complicates their mission in ways they never could have prepared for. In an age where “different” automatically means “dark”, it should come as no surprise that Discovery takes a predictably “different” approach than its predecessors. Not that it’s the first to do so. Deep Space Nine wasn’t afraid to get its hands dirty, and Enterprise certainly gave it the old college try, but Discovery seems content to mimic every other long-running franchise that took a “different” approach. Characters are multi-layered (usually meaning they have “dark” secrets), alliances are forged and broken, and the next twist is always around the corner. It works fine as a standalone show, but sadly doesn’t blend with the optimistic future Star Trek fans have spent 50+ years falling in love with. There’s no family dynamic, which has always been a proud aspect of Star Trek, but the characters are likable and their chemistry gets stronger as the season progresses, which is critical on any show with an ensemble cast. First seasons are usually about a show finding itself, and that’s one thing that does seem to come across well enough. There isn’t a precise tone to this season (which is a problem), and the twists do get tiring the further into the season you get, but everything does come together rather neatly towards the end which tells me that the writers might actually have some decent plans for future seasons. Why they changed the look of the Klingons after 50+ years is quite baffling to me. Not that these versions don’t look good in their own right. But the Klingons’ appearance was “finalized” sometime in the early 1980’s, and for 30+ years it’s worked just fine. The Vulcans still look like their 1966 counterparts, but the Klingons now look like a totally new species. On the plus side, their language and culture remain the same, the performances are strong, and they come off as a truly formidable villain in a time of war. The rest of the storylines are compelling enough that waiting a week between episodes is hardly ever a problem. A character can disappear for several episodes and the second they come back, I remember who they are and where their storyline left off. Recaps help of course, but there’s no doubt that this show knows how to keep its audience engaged. As a prequel to a Sci-Fi show from the 1960’s, it’s impossible to believe that that now-low-tech future is an “advancement” of the one here, but we already went through that with Enterprise. Discovery is doing its own thing, and for better or worse, that’s okay. Whether you agree with the new “darker” approach to Star Trek or not, there’s little doubt that Discovery is a reasonably competent show. It’s definitely still finding itself after only one season, but the ingredients for a great show are all in place. The final moments of the season give hope that the Discovery’s adventures will soon blend into Original Series territory, and possibly a tonal return to the optimistic future “Trekkies” long to revisit. And even if it never achieves the greatness its potential suggests, it’s still Star Trek, so it’s absolutely worth a watch. This entry was posted in Reviews, The Reviewinator, TV. Bookmark the permalink.